With no Deshaun Watson, the Houston Texans turned to QB Tom Savage against the Indianapolis Colts, with limited success, dropping the game to Indy 20-14. The Colts and the connection of QB Jacoby Brissett to WR T.Y. Hilton set the pace early with a 45-yard touchdown pass in the first quarter. They followed that up with a highlight reel 80-yard touchdown pass in the third quarter in which Hilton flipped over a defender, and untouched, picked himself up off the ground to scamper in for the long score. Savage and the Texans made it interesting, however, as down 20-7, they got back on the board with a 34-yard strike to WR DeAndre Hopkins to push the contest to within one possession. After getting the ball back and time winding down, Houston drove down all the way down to the Colts seven-yard line and a fourth and goal to go situation. 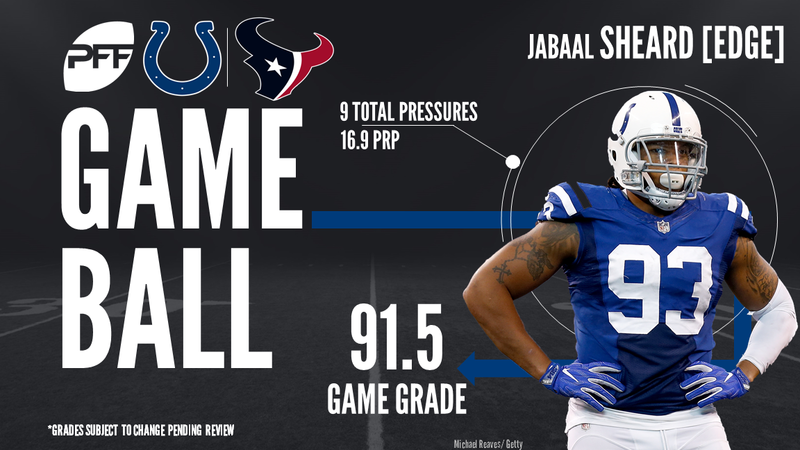 Savage was sacked and fumbled on the game’s final play by Indianapolis edge defender Jabaal Sheard, which was picked up by LB Barkevious Mingo to end the game, and with that, we give you our PFF exclusive takeaways from the contest for each team. Hilton came to play for the Colts, as he used his speed to gather five catches for 175 yards and lead the Indy to victory. Hilton started things off with a perfect post route for a touchdown and later added an 80-yard catch-and-run for the score. While he did have a dropped pass, Hilton forced a missed tackle on his second touchdown. Hilton finished the day averaging a ridiculous 5.47 yards per route run. It was a pretty average game for Brissett, which is all the Colts can ask of him at this point. He mixed in some truly high-level throws, like his 45-yard touchdown throw in the first quarter, with some less-than-stellar ones. He finished with decent numbers, but most of what he did came on short passes. He did have some success going deep, completing 3-of-6 passes beyond 10 yards for 86 yards and a touchdown. He finished the day with an impressive 82.1 adjusted completion percentage. Sheard almost single-handedly wrecked the Texans’ passing game, as he consistently affected the quarterback. He was able to finish with two sacks, one QB hit, and six QB pressures on his 46 pass-rushing snaps. Sheard ended the Texans chances beating LT Julien Davenport with a strip-sack on the game’s final play. Bostic was all over the field on Sunday, having a positive impact on both the running and passing game. He filled up the stat sheet, finishing with two QB hits, one QB hurry and six tackles, including two solo stops. When targeted in coverage, Bostic was consistently tight to his man, giving up just one catch for 14 yards on his one targets with two passes defenced. Savage had a tough day but was able to make some key throws down the stretch to give his team a chance in the final minute. Though he didn’t throw an interception, Savage fired a number of throws to Colts defenders that resulted in incompletions. He was under pressure on 47.8 percent of his dropbacks, but it was his work in a clean pocket that held the offense back. Savage went 10-of-24 for 82 yards in that area. The offense badly missed injured quarterback Deshaun Watson and his play-making ability outside the structure of the offense. Both tackles were exposed on the edge consistently and were unable to be bailed out by Savage this week like we have seen Watson do this season. Both players combined to give up seven pressures and a sack, with a number of plays they were beaten on as well with the quickness of the throw helping them out. Reader was nearly unblockable in this game, especially against the run. He finished with two solo run stops, but even that doesn’t do his impact justice. He was consistently blowing up plays and closing holes shut to completely change the Colts’ run game. His 90.5 run defense grade was a big reason why the Colts gained just 80 rushing yards on 26 carries. He also added two quarterback hurries while rushing the passer. Pleasant was solid all game, but it was two plays that were technically back-to-back that really impacted the game. He had a fantastic strip sack of Brissett late in the first half that was returned for a touchdown. He then sacked Brissett again on the first play after the kickoff, preventing any late-half two-minute drill from the Colts. Pleasant was thrown at just once when he was in one-on-one coverage, and he stopped the receiver for just a four-yard gain and forced a punt.